True, life has moved on for the cast members and, hopefully, for everyone else. But that doesn’t mean cotinued enjoyment can’t be had with repeat viewings! I’ve been watching it for years and I still catch small nuances that reward repeat viewings. (For example, in the episode where Jerry is persuading Babu to convert his cafe to a Pakistani restaurant, there’s a scene where he things to himself, “I am a great man,” and he’s next to a bust of Alexander the Great, holding his head in the same position.) I guess my favorite show is about nothing, even after all these years. Sad? Maybe. It’s true. I can’t even tell which things were supposed to be humorous and which things were not on that show. None of it is funny anymore. It’s like that inside joke you had to be there for. 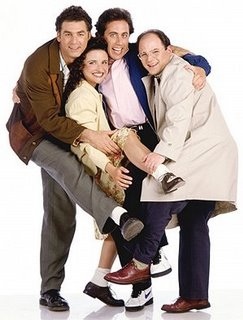 I just wanted to say, I’m 19 and I still LOVE seinfeld. But, whenever I reference the show most of my friends have no idea what I’m talking about.